Up on a hill overlooking Derry City lies Creggan Country park, the site of an old reservoir which is now used for water-sports and fishing. As I crested the hill I got my first glimpse of an interesting building, slate walls and a green roof lifted my hopes that this could be an oasis in the midst of residential housing. A crowd was milling at the entrance and I joined them to introduce myself to Mervyn, one of the Northern Velocity coaches. With changing rooms and showers above the gated lake this is not a wild swimming area, but it does provide a safe training zone for those wishing to venture into the open water. 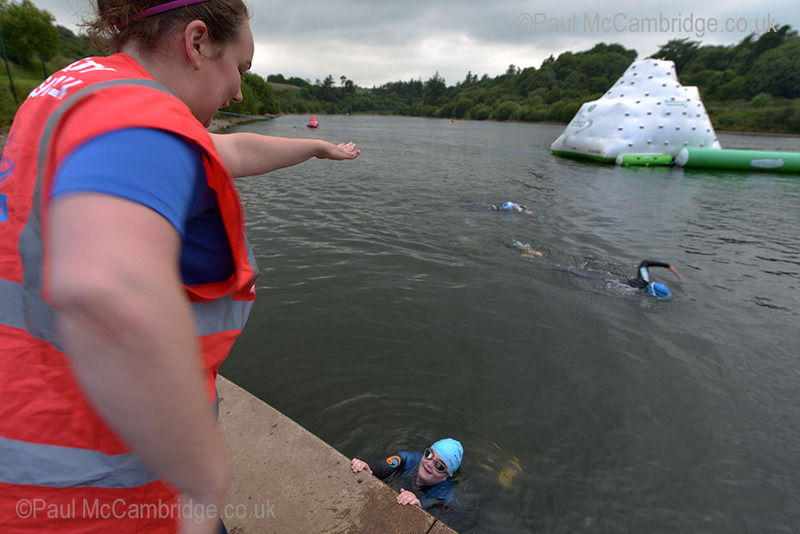 The water quickly becomes deep and each of the wet-suited swimmers scanned their micro-chipped armbands as they made their way in to swim the 1km loop, with the swimmers content to swim at their own pace a couple of kayaks paddled out as safety craft. The advantage of Creggan is that it is compact and swimmers are always visible from the slipway, marker buoys form a loop that never sees the swimmer too far from the shoreline. Beside the concrete jetty new swimmers can slip into deep water yet be coached from the side before venturing out into the main body of the lake for their first lap. This is the opportunity, for some the first time, to experience the lack of visibility in lake swimming. 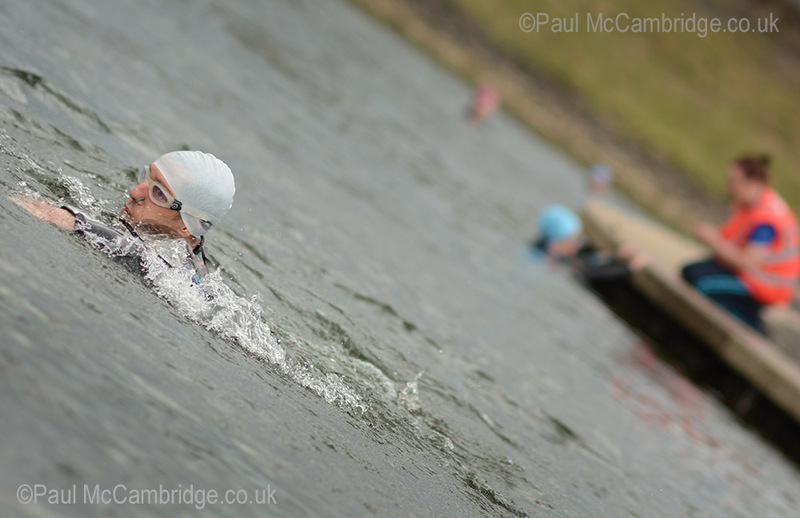 The shock of colder water – (some swimmers will never again say an indoor pool is cold!) and the feeling of exposure in a much larger expanse of water than previously experienced. Ranks of inflatables and kayaks moored up create a separate area for these test swims and the large zorbing balls and great green and white climbing pyramid show this site is well used by young and old. If you want a play session for yourself and the kids, check out the Country Parks activity program and if you want a safe, well-marked training area they can give all the times when swimmers are welcome. This entry was posted in Wild Swimming, Wild Swimming Ireland and tagged Boy, Cold, Derry, Derry/Londonderry, Enjoy, Ireland, lake, Londonderry, MAC Visual Media, Mo McCoy, Northern Ireland, open water, Paul McCambridge, Race, swim, Swimmers, swimming, Training, Tri, Triathlete, Triathlon, Velocity, water, Wetsuit, wild swim, wild swimming, wildswim, Woman by wildswims. Bookmark the permalink.